Have you ever noticed when you jump that you either get pitched forward as the horse goes over the fence or fall back in the saddle on landing? Perhaps you ride dressage or western and you feel like your hips are stiff. The problem may not be in your hips but instead in the way you use your pelvis in relation to your hips. Your hips are a ball and socket joint. Without muscles (and some people who are really good at yoga) you would be able to put both of your feet behind your head because the hip joint have tremendous mobility. In reality we have to limit the mobility in the hips in order to stand, walk and ride. In order to control the movement of the hip there are strong ligaments, which prevent the hip joint from going too far in one direction or the other. These ligaments act to control the movement in the hip without having to use muscles. In addition there are muscles that surround the hip joint to move the leg in various directions, adduction abduction, internal rotation, external rotation, extending the hip (I call this opening) and flexing the hip joint (I call this closing). In most cases it is what you are doing with your pelvis causing your hips to act as if they are stiff. When the pelvis is in a good alignment the hips can easily open and close. Next time you ride; try this exercise at the halt on a quiet horse. 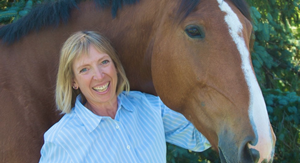 Fold forward and see if you can touch your horse’s ears. 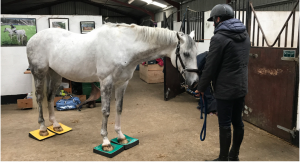 Notice if your arms feel too short or if you feel like you are falling onto the horse’s neck instead of staying well balanced over your feet. 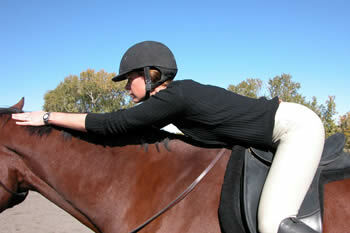 Observe if your arms want to drop towards the lower portion of the horse’s neck instead of the ears. Take one hand and feel your back. Is it round, flat or arched? 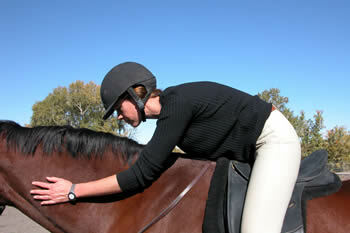 Place your hands on each side of the horse’s neck and gently change the angle of your pelvis. 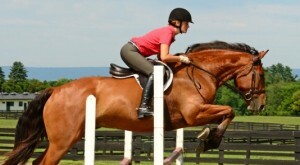 In what position of your pelvis is it easiest close your hip and reach your horse’s ears? If you feel like you can’t find a good position no matter what you do, push your buttocks towards the cantle of the saddle. This will give you a bit more room to fold at the hips and not the waist. As you explore your position, notice that when you are folding at the hips your arms extend without effort. If your back is rounded your arms feel very heavy and want to drop down. If your back is arched you will not be able extend the arms easily. When attempting to sit upright with an arched back, you will have to pull yourself up with your upper body because your hips remain in a closed position. Practice finding the alignment of your pelvis that allows your hips to open and close easily. Slide your hands towards you, yet still on the top of your horse’s neck, and see if you can push yourself upright by opening at the hips without changing the angle of your pelvis. Go slowly and feel where the alignment of your pelvis makes opening and closing your hips the easiest. Use this Murdoch Minute as a ‘body position self-check’ to find and fold at your hip joints. Folding at your hips when riding in a forward position (regardless of the degree of angle will ensure that you remain deep and secure in the saddle regardless of the degree of fold. Finding your hips when riding on the flat will allow this joint to absorb the motion of your horse, making your sitting trot easier. And remember – enjoy the ride!